The problem is that the click event handlers for the option1 and option2 nav pills never fire. I stared at this for quite awhile, made a lot of incorrect guesses, and tried a lot of solutions, all to no avail. The frustration was exacerbated because at one point they DID work. Turns out a seemingly unrelated change was implemented and the UI was never retested, but I’ll address that shortly. Finally, I *saw* it and all was clear. 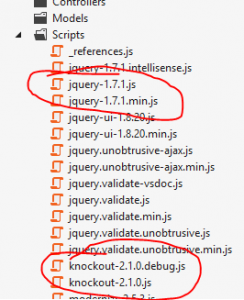 If you are an experienced Knockout developer, you may have already spotted the culprit. If not don’t worry, I won’t make you wait: the offense here is in using the Knockout ‘if’ binding. On the surface, the if binding acts like the visibility binding, only showing the HTML element (and hence its children) if the matching condition is true. What if actually does is physically add and remove elements from the DOM, which is what caused the problem. When the page loads, and the bindings are created, the value of Companies() is an empty observableArray, which caused the if binding to interpret as false and remove the DOM elements. Since the elements are no longer part of the DOM, jQuery had no targets to bind the events. In other words, it was functioning exactly as designed. It turns out I had recently moved this particular if binding higher in the DOM heirarchy. It used to be in the div after the nav-pills and moving it back there fixed the bug. Another solution would have been to change the binding from if to visible. I’m sure there are more complex solutions, like dynamically adding the jQuery bindings but that seemed unnecessary and nontrivial. At the end of the day, it was not Bootstrap, Knockout or jQuery at fault: it was me. The true cause was my choice of if instead of visible because I liked the syntax better and not for any technical reason. Posted: September 27, 2012 September 27, 2012 . Since I started at Lotic Factor I’ve been sharing a list of links with my coworkers we call “The Weekly Roundup”. There is no set schedule but typically I send out a list about once a week. The links mostly come from Twitter and various newsletters. The concept is nothing new, but it saves them from needing to spend as much time on twitter as I do! I’m sharing them in the hopes that some readers may find them interesting as well, and also as an archive of past links. DISCLAIMER: The only qualification for inclusion is that I found them interesting. In no way are the links or articles vetted, nor does their inclusion constitute agreement with, adherence to, or support of any claim, position, prognostication, or statement contained therein, by either myself or my employer. Will a Household License Convince you to go with Office in the Cloud? Are Marketers Wasting Money on Mobile Ad Clicks? What’s so Bad about delighting users? Posted: September 21, 2012 September 21, 2012 . On a recent This Week inWindows broadcast, Leo and Mary Jo Foley discussed some of the issues introduced by Microsoft’s abandonment of the Metro brand. The problem is a serious annoyance to developers and especially technical teachers, bloggers, presenters, and authors. It’s also the source of some not-always-so-good-natured ribbing from the technical community. I’m a big fan of using proper terminology, so when Microsoft declared that Metro was verboten I dutifully tried to expunge it from my vocabulary, but I find it increasingly difficult. Metro was used to refer to the new design language, but it also referred to the new Windows 8 experience. The tile-driven, blocky, clean and modern look and feel of Metro was already present on Xbox, Zune, and a host of other applications and websites. Discussing this UI approach without using the word Metro is a challenge, so what should we be saying instead? There was a period of uncertainty created by the void of Metro. Some replacement names were floated around, some were not even all that bad such as “Modern”, and some were more in keeping with Microsoft, such as “Windows 8 Style”. For a time Microsoft was quiet on the question of “what do we call it now?” but finally Visual Studio 2012 RTM’ed and we had the official answer. Metro is now rebranded “Windows Store”, so the style is now the “Windows Store Style” and the applications are “Windows Store Applications”. Having spoken on Windows 8 development numerous times in the recent past, let me tell you that this is no fun at all, and it certainly doesn’t make sense in every scenario. I’ve long referred to the new start experience as the Start page, but it makes no sense to refer to the new face of Windows 8 as “Windows Store Applications Start Experience”. I tried to refer to it as just Windows 8, but that isn’t fair as the desktop is also part of Windows 8. You can try just calling it Windows 8 Style, but let’s get real: life was much easier when we had “desktop” and “Metro”. To address this issue, I’d like to suggest a community driven rebranding: let’s start using the phrase FIRST Apps. FIRST is an acronym for Fluid, Immersive, Responsive, Service-oriented, and Touch-friendly. Let’s discuss each of these in turn. Fluid – Modern applications should be easy on the eye and engaging. Navigation should be animated and lively, utilizing animations, transitions, and easing. Effective use of white space and visual cues provide hints to more content. Immersive – Content is King, and we should minimize anything that detracts from the content. These detractors, known as “the Chrome”, are very familiar to Windows users: menus, toolbars, status bars, navigation links, context menus, and so on. These items do not need to be visible all the time: every pixel they use decreases the area available to present the thing the user cares about the most, the Content. Responsive – Applications should start, load, and react quickly. Heavy adoption of asynchronous techniques drive at least an illusion of performance and provide a non-blocking UI experience. Applications should start and reactivate quickly. Service-oriented – I would also accept “Sharable” or “Social”. This indicates an active reliance on content services, typically supplied by some cloud or web service or social interaction. It should be easy to share content with other people and applications. Touch-friendly – non-traditional devices increasingly dominate the user experience, and the vast majority of these new devices are touch based. Touch support is included as part of WinRT but we still have to consider is as a design feature. Adequate spacing, large friendly touchable items, and adherence to common gestures should be standard features. I believe that FIRST embodies the intent and style of the brand formerly known as Metro. It has the added benefit of being short easy to say. Metro is dead, long live FIRST! Posted: September 17, 2012 . I’ve been busy and traveling, so it’s a short list this week. Posted: September 14, 2012 September 14, 2012 . What does “no compromises” mean? Amazon, Google, and Microsoft: oh my! Posted: September 10, 2012 . Before we begin, please understand that I dislike the argument “that’s just semantics”. For the record, I’m also not fond of “it’s all relative”, but I’ll save that rant for another post. If semantics aren’t important then neither are spelling, grammar, punctuation, and pronunciation. I have had a long uphill battle trying to convince my children that words and phrases have meaning, and the terms “whatever” and “you know what I mean” are not Get Out of Jail Free cards for proper use of the English language. They are surely sick of hearing me say “words matter”. This practice is commonly referred to as a “self-executing function” or sometimes “self-invoking”. The function, in this case anonymous, is wrapped in a set of parentheses which contains the scope of its variables within the function, hence protecting them from outside interference. The second set of parentheses trigger the execution of the code contained within the first set. In other words, the first set of parentheses defines the function and the second set immediately executes the function. This syntax is also used to differentiate between function declarations and function expressions. There’s plenty more we could discuss about this, and even a few alternate syntax examples, but I don’t want to get too far away from my point, which is this is not “self-executing”. The parentheses that execute the function are defined outside the function boundaries. A truly self-executing function would cause itself to execute, which I don’t believe is possible. Recursion is close, but it still couldn’t account for the initial function execution. More accurately, this is an “immediately executed” function. This post was going to be more long winded but I found a great article aptly titled Immediately-Invoked Function Expression by Ben Alman that does a much better job of explaining the details than I could have. The acronym (IIFE) may be pronounced “iffy”, but there’s no question in my mind it’s the better choice. I used to blog extensively at http://developingfor.net, primarily about .NET topics but occasionally others. Strangely enough, I hardly ever blogged about Microsoft Expression Blend (the topic I’m best known for), mostly because I had other outlets for that information. I essentially quit blogging when I began writing my book, Expression Blend in Action: a developer’s guide. Anyone who’s written a book will tell you it eats up a significant portion of your free time, so I’m sure it is no surprise that I had precious little time for blogging. As the book neared completion, Microsoft threw us all for a loop with the first BUILD conference and the announcement of Windows 8. Along with Windows 8 comes a brand new runtime and a new development stack. I’ve always been a generalist, happily bouncing from technology to technology, even platform to platform, but .NET was my core for nearly a decade. Amid the changes in the Microsoft desktop stack, I began working on a large ASP.NET MVC project, a rewrite of an old CGI application I had written in 2000. This project rekindled a passion for web development I had almost forgotten about. Along the way I also changed jobs, a big step considering I had been with my previous employer for over 11 years. With a new job, a new focus, and a new platform, a new blog seemed fitting. I hope you’ll join me as I begin anew. Posted: September 3, 2012 .